Why Choose a School Holiday Shoppe? 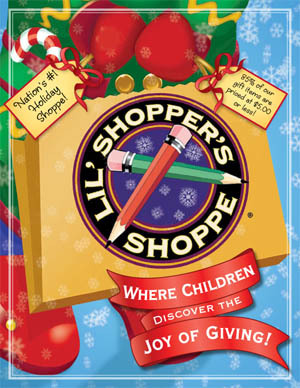 The Lil Shopper’s Shoppe fundraiser offers over 115 high quality gifts. It allows your child to shop for the holidays for your child’s family and friends. It teaches students the importance of money management, and the joy of giving. A small shop can be set up at your location to allow young shoppers the perfect opportunity to choose gifts for family and friends in a friendly low pressure environment. Lil Shopper’s Shoppe features a wide selection of great gifts as well as everything you need to make this fundraiser a success. We provide you with parent letters in (English & Spanish), budget envelopes, color posters and instruction manual, tablecloths, three different size bags, price cards, free use of a cash register with your mark up already programmed, free shipping and much more. It’s as easy as 1,2 3. Your organization pays only for the merchandise that is sold.